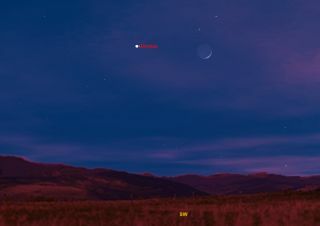 This sky map shows how the planet Venus and the moon will appear in the southwestern sky at 5 p.m. local time on Dec. 26, 2011. UPDATE: See our full photo gallery of the Venus-moon conjunction here and get more skywatching tips for Venus for Dec. 27. For those still recovering from an active Christmas Day, there will be a celestial sight pretty enough to adorn your Christmas tree on the evening after Christmas. On Monday (Dec. 26), known as Boxing Day in Commonwealth nations like Canada and the United Kingdom): The brilliant planet Venus will shine prominently in the vicinity of a lovely crescent moon. The Venus-moon sky show repeats on Tuesday night, too. On Monday, check the south-southwest sky right after the sun sets. Venus will likely catch your eye first since it will be shining about one-fifth of the way up from the horizon. Now look off to the right and at a slightly lower altitude from Venus and you'll also catch sight of the slender sliver of a waxing crescent moon. The eye-catching duo will quickly descend as the sky darkens, finally setting about 2 1/2 hours after sunset, beyond the southwest horizon. The sky map available here shows how Venus and the moon appear on Monday. This will not be a particularly close conjunction (as groupings of planets are called) since Venus will be hovering about 7 degrees from the moon. Your clenched fist held at arm’s length measures roughly 10 degrees. Still, the two sky objects will likely attract immediate attention because of their magnificent brightness. Venus shines at magnitude -4 on the scale astronomers use to measure and object's brightness. On the scale, the lower the magnitude number, the brighter the object appears. On this scale Venus is 11 times brighter than Sirius, the brightest star in the night sky. The moon will be a little more than two days past new phase and will only be about 6 percent illuminated. Look for the beautiful phenomenon known as "earthshine" — sunlight reflected by the Earth, directed toward the moon and dimly illuminating its dark portion with a faint grey-blue glow. That effect will impart an almost three-dimensional appearance to the moon and will enhance the overall scene. Venus is currently 123 million miles (197 million kilometers) from the Earth. But the moon is only about 235,000 miles (379,000 km) away and as a result appears to move much more rapidly against the background stars than Venus. By the time the sun sets on Tuesday evening, the configuration between Venus and the moon will have markedly changed. In fact, the moon – whose illuminated sliver will have noticeably widened to 12 percent – will now be positioned high above Venus. If you drop an imaginary line straight down from the Moon and you will hit Venus some 10 degrees ("one fist") away. And the moon's proximity relative to Venus will give you an excellent chance to try and glimpse Venus during the daytime. If your sky is mostly clear with little or no haze, check your south-southwest sky during the late afternoon hours of Monday and Tuesday before sunset and try to locate the moon. It will most likely be easier to do this on Tuesday since the moon will be higher and a thicker crescent. If you find the moon, remember that on Monday, Venus will be positioned about 7 degrees to the moon's left and will be a bit higher up. On Tuesday look roughly "one fist" below the moon to find Venus. It will be visible as a tiny white speck of light against the blue sky background. Another fine (albeit similarly wide) pairing-off of Venus and moon will again occur a month from now, on Jan. 25 and 26. If you snap an amazing photo of venus and the moon and would like to share it with SPACE.com, contact managing editor Tariq Malik at tmalik@space.com.